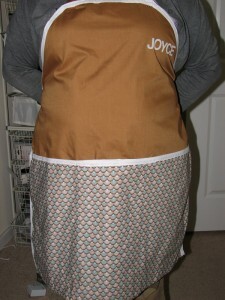 I made a few aprons this year, including a matching pair for my stepmother-in-law Joyce and her mother Rose. Rose lives with my in-laws in England, and she is 95-years-old and about 4′ tall. 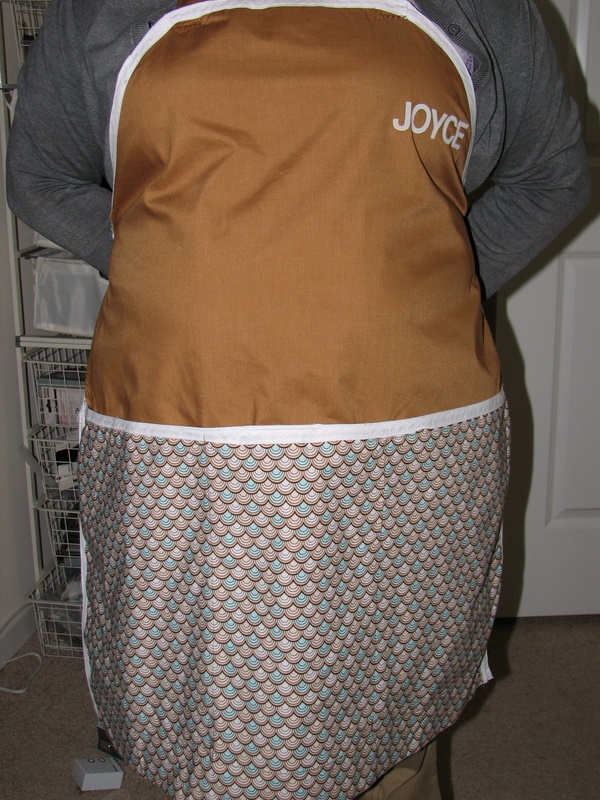 It is nearly impossible to find things that fit her, so after I made the apron I’m modeling in this photo for Joyce, I shrunk all my measurements down to about 80% of the original and made a Rose-sized version with her name on it, too. I was racing to get these finished and shipped off in time for Christmas, so I didn’t take enough photos of the finished pair. And I didn’t get them shipped off in time for Christmas, I’m still waiting for these to land on the shores of the UK. I included some kitchen goodies with Joyce’s apron, and we also gave her a copy of James Beard’s Fireside Cookbook-Amazon delivered that in time for Christmas. But I’m hoping these two ladies will enjoy their matching aprons, I love this color combination.